When creating the application, I only need to tell Durandal to use the observable plugin. And now all my view models can be plain, simple objects. 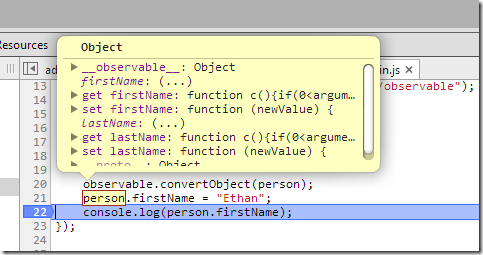 At the core of the observable plugin is Object.defineProperty. This ES5 API requires a compatible browser, but fortunately even IE9 has support. The defineProperty method can build a property with get and set logic, as in the following example. With Durandal, you never have to worry about using defineProperty directly. Durandal’s observable plugin provides an API to convert all the properties of an object into Knockout compatible observables using defineProperty. If we look at the object in the debugger, we’ll see the following. But even the above code is something you don’t need to write, because Durandal will automatically convert view models into observable objects ready for 2 way data binding before bindings are applied. There’s a lot to be said for frameworks that care about making things easy for the developer. Hi, where do you tell durandal to use the observable plugin? I thought it would be in the config but the code above doesn't seem to show that as far as I can tell? @Robert: thanks for pointing that out. @MattB: I actually forgot that in the code (updated now), it's during app.configurePlugins. So if you enable this, all properties are observable? Wont that make it much harder if you want to perform some optimisations like throttling? Can you prevent some properties from being observable too if you know they are never going to change? @4imble: will have to check on that one, not sure. It's great that ES5 support is now so ubiquitous. I assume this is why Steve Sanderson has stepped away from supporting the Knockout Mapping plugin. I continue to use his mapping plugin so I can assure old IE support when working in Durandal. I'm aware of three ways to save yourself the work of declaring observables manually: 1. Knockout mapping plugin https://github.com/SteveSanderson/knockout.mapping 2. Knockout ES5 plugin https://github.com/SteveSanderson/knockout-es5 3. Durandal observable plugin discussed above (if working with Durandal, obviously) Great post Scott!